Federation University Australia > About us > Our university > Our history > Geoffrey Blainey Research Centre > Honour Roll > DITCHBURN, Ernest Norman V.
Ernest Ditchburn was a former Ballarat School of Mines (SMB) student, successfully passing the final examination in Mining Surveying in 1899, and Practical Chemistry in 1900. Ditchburn enlisted into the 1st Victorian Mounted Infantry during the Boer War. After the Federation of Australian states in 1901 he became a member of the 2nd Commonwealth Horse. 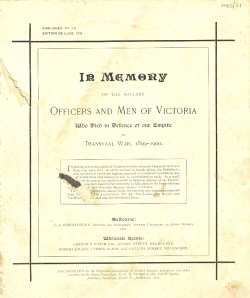 He sailed from Melbourne on 15 February 1901, and after completing his South African service the 1902 Ballarat School of Mines Magazine recorded: "Private E. Ditchburn of K Coy VMR, who was "out on active service" with the first Victorian Contingent, returned to Ballarat on Wednesday, August 1st. A large number of students assembled at the station to give him a welcome. He very nearly eluded his student friends by effecting a rapid flank movement through a side door, only to fall into an ambush and be immediately surrounded by a cheering crowd. He afterwards "held forth" from Con Burrow's verandah, much to the delight of the students, who are justly proud of their representative in khaki. It is fair to conclude that "Ditchie" has amassed a stock of yarns sufficient to last him for the rest of his existence." Further details are currently being sought on Ditchburn's post-Boer War career. This biography compiled by Clare Gervasoni, April 2006.